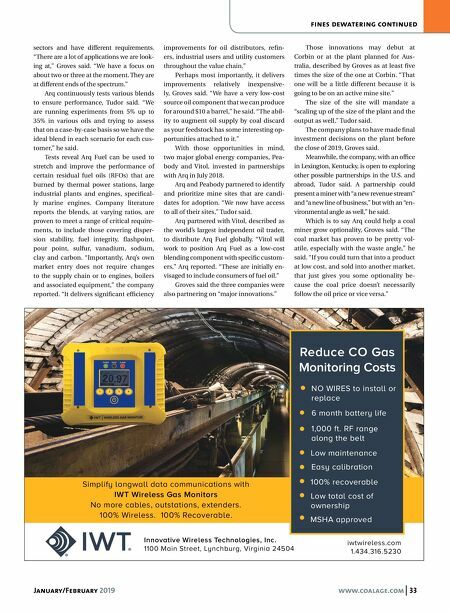 January/February 2019 www.coalage.com 33 fines dewatering continued Simplify longwall data communications with IWT Wireless Gas Monitors No more cables, outstations, extenders. 100% Wireless. 100% Recoverable. Innovative Wireless Technologies, Inc. 1100 Main Street, Lynchburg, Virginia 24504 iwtwireless.com 1.434.316.5230 NO WIRES to install or replace Easy calibration Reduce CO Gas Monitoring Costs 6 month battery life 1,000 ft. RF range along the belt Low maintenance 100% recoverable Low total cost of ownership MSHA approved sectors and have different requirements. "There are a lot of applications we are look- ing at," Groves said. "We have a focus on about two or three at the moment. They are at different ends of the spectrum." Arq continuously tests various blends to ensure performance, Tudor said. "We are running experiments from 5% up to 35% in various oils and trying to assess that on a case-by-case basis so we have the ideal blend in each scenario for each cus- tomer," he said. Tests reveal Arq Fuel can be used to stretch and improve the performance of certain residual fuel oils (RFOs) that are burned by thermal power stations, large industrial plants and engines, specifical- ly marine engines. Company literature reports the blends, at varying ratios, are proven to meet a range of critical require- ments, to include those covering disper- sion stability, fuel integrity, flashpoint, pour point, sulfur, vanadium, sodium, clay and carbon. "Importantly, Arq's own market entry does not require changes to the supply chain or to engines, boilers and associated equipment," the company reported. "It delivers significant efficiency improvements for oil distributors, refin- ers, industrial users and utility customers throughout the value chain." Perhaps most importantly, it delivers improvements relatively inexpensive- ly, Groves said. "We have a very low-cost source oil component that we can produce for around $10 a barrel," he said. "The abil- ity to augment oil supply by coal discard as your feedstock has some interesting op- portunities attached to it." With those opportunities in mind, two major global energy companies, Pea- body and Vitol, invested in partnerships with Arq in July 2018. Arq and Peabody partnered to identify and prioritize mine sites that are candi- dates for adoption. "We now have access to all of their sites," Tudor said. Arq partnered with Vitol, described as the world's largest independent oil trader, to distribute Arq Fuel globally. "Vitol will work to position Arq Fuel as a low-cost blending component with specific custom- ers," Arq reported. "These are initially en- visaged to include consumers of fuel oil." Groves said the three companies were also partnering on "major innovations." Those innovations may debut at Corbin or at the plant planned for Aus- tralia, described by Groves as at least five times the size of the one at Corbin. "That one will be a little different because it is going to be on an active mine site." The size of the site will mandate a "scaling up of the size of the plant and the output as well," Tudor said. The company plans to have made final investment decisions on the plant before the close of 2019, Groves said. Meanwhile, the company, with an office in Lexington, Kentucky, is open to exploring other possible partnerships in the U.S. and abroad, Tudor said. A partnership could present a miner with "a new revenue stream" and "a new line of business," but with an "en- vironmental angle as well," he said. Which is to say Arq could help a coal miner grow optionality, Groves said. "The coal market has proven to be pretty vol- atile, especially with the waste angle," he said. "If you could turn that into a product at low cost, and sold into another market, that just gives you some optionality be- cause the coal price doesn't necessarily follow the oil price or vice versa."